The rules are different out here. Shaped by nature just like the Outer Banks were swept from the Atlantic Ocean. The Roanoke Island colonists to first settle the Americas only to mysteriously disappear. The first flight launched by the Wright brothers, forever changing the trajectory of the human race. Cape Hatteras National Seashore, the first national seashore of its kind, complete with rolling sand dunes and menagerie of wildlife. 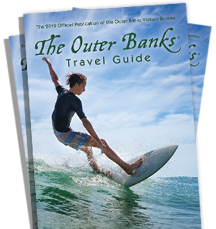 And still today, after hundreds of years, the Outer Banks has a way of changing people and opening their eyes to new experiences and passions in historic North Carolina. For sure, there are many firsts still yet to come. But for now, take a step into the past and experience the history that helped make this place a true original.